This was a pair of concerts of Rachmaninov’s piano concertos commemorating the 145th anniversary of the composer. It also was uniting two musicians who are intrinsically linked by their association with Rachmaninov’s music. 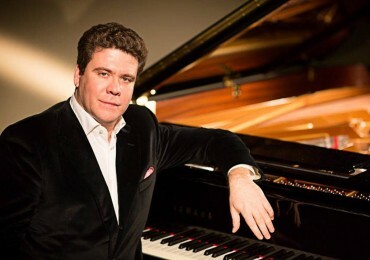 Denis Matsuev is among the finest Russian pianists, and since winning the Tchaikovsky Piano Competition in 1998, he has developed a formidable reputation for his charitable activities, including appointment as a UNESCO Goodwill Ambassador. He is involved in several music festivals including the Annecy Festival in France, and in several major music festivals in Russia. Matsuev has developed a fine collaboration with Sladkovsky over the last decade and now regularly plays with the Tatarstan orchestra and has proved a great ambassador too for the Kazan orchestra. Matsuev claims Sladkovsky is the best conductor of Rachmaninov in Russia, a considerable claim and on this evening proved well verified. The concerts of all Rachmaninov’s works for piano and orchestra was the first such event to include all five works over two evenings for twenty years in the Russian capital. The venue was the Tchaikovsky Concert Hall which dates back to 1940 and was built on the site of the Meyerhold (TIM) Theatre, and originally on the site of the Bouffe-Miniature Theatre of Charles Aumon at the beginning of the 20th century. As I noticed when last in Russia a year ago, a constant blight to events are latecomers, which delayed the start by fifteen minutes, yet another distraction is the use of mobile phones to take selfies, and in some cases to film the concert from their seat. In the First Concerto’s thunderous opening, Matsuev showed wonderful ornamentation in his solo passages, displaying incredible technique at the keyboard against energetic and graceful conducting, here Sladkovsky set divided violins with the basses far left, with the piano located well in front of the orchestra, helping to project its sound. In the recapitulation of the main idea of the first movement, the rubatos were clear, and exact, and there was a rich variety in the phrasing. An exceptional quality of this orchestra was the articulation by the woodwind section, and the crossing of hands in the difficult piano passages by Matsuev brought out all the dark romanticism of the score and that northern Slavic quality which is characteristic of this composer. The solo passages reflected the intensity of concentration and did not hamper the beauty of the writing. The French horn in the adagio was a wonderful introduction for the solo piano and most beautiful reflected in the cadenza, so idyllic as if we were in a summer garden, and when joined by strings, and the clarinet, the mood gently changed. In the finale, there was a swift change of tempo, like a racehorse speeding to the finishing line, with chirpy clarinets, sparkling technique by Matsuev, especially by the cross-rhythmic patterns on the keyboard. The tone was now reflective and supported by fervent strings, and the vivid woodwind setting up for an exciting finale. Straight after the applause died down, we were off straight into the Rhapsody on a Theme of Paganini. This was a sign of just how good this orchestra is, notably with Sladkovsky assisting in directing a chamber-like repartee between orchestra and soloist. Slowly but intently, the darker colours of the night descended with the magical strings setting the mood. Sladkovsky has great hands, his gestures producing the slightest switch in colour and in orchestral nuancing. He has a great presence and shows his pleasure at a musician when he plays a fine solo. The orchestra played with great inflection and intensity. With the famous variation No.18, the Andante cantabile in D major, Matsuev was superbly assisted by the orchestra, there was a mad rush to the final variation, all brought off with stunning virtuosity. In the Second Concerto, we heard the slow and steady tread of the piano chords building the tension, beautifully supported by the orchestra, with a superb affinity between soloist and the conductor, emphasised with the colours from the clarinets, flutes, and oboes. We heard a strong rubato expressed in the second theme of the opening movement from Matsuev. For a work which must have been played by these musicians hundreds of times, there was a welcome freshness as if discovering this work anew, and what a lovely solo too from the French horn! The quiet passages conveying a wonderful sympathy between Matsuev and the orchestra. In the second movement, there was a lovely introduction for Matsuev accompanied by the flute and clarinet deftly building the mood, and straight into the finale with dramatic excitement from the brass and percussion, and then the return of the big theme from the first movement bringing this piece to a celebratory culmination. At the close, there were many presentations of flowers and gifts for the conductor and soloist. The second evening opened with the bonus of a rarely heard early piece and I can only recall hearing this once in the concert hall. ‘The Rock’ was written in dedication to Rimsky-Korsakov, and Tchaikovsky praised the symphonic fantasy highly and planned to include it in his own conducting programmes shortly before his sudden death. It is based on a story by Chekhov about one night when a girl who meets an old man who shares all his life’s woes and joys during a blizzard on Christmas Eve. This piece was an opportunity to witness the conducting of Alexander Sladkovsky and here he displayed a great charisma and employing a fine expansive technique, he allows the musicians freedom to expression and to display their own virtuosity of which this orchestra has a great deal. Sladkovsky directed this piece as he would with any of the composer’s symphonies, with appropriate temperateness in evincing the darkness of tone colour from the basses and quietly setting the tone. The mood somewhat transforms when the French horn releases a theme joined by the flute, and lighter colours are added by the harp and violins, sounding almost like the sun rising on a misty morning. The oboes and clarinets are heard, and the first dark idea returns on the cellos, it seemed to me the kinship here is with the nationalist school, and especially to Lyadov’s orchestral miniatures. Slowly this colourful piece increases in tempos to a festive spirit before it slowly dies away on the basses. With little or no break, apart from the conductor making the solo players take their bows, the orchestra were joined by Matsuev for the Fourth Piano Concerto, and at the keyboard, the Siberian entered powerfully, and impressed with superb control of the dynamics in this problematic concertante work. In what is a challenging composition, with swift changes in dynamics, the brass and woodwind made a powerful impact; a special highlight was a beautiful passage on the oboe before the close of the Allegro vivace, whilst the following Largo was distinguished by an idyllic passage enjoying wonderful rapport with the orchestra, this sustained lyricism was extended by the soloist’s solo passages. In the fiery finale, there was some magical playing; brilliantly exciting in its energy and power. Finally, bringing this mammoth series to a close was the most difficult Third Piano Concerto, and arguably finest concerto by Rachmaninov, it all started with sensitive playing by Matsuev, and such complicated keyboard writing (which even frightened the composer) seems of little problem for the soloist, here he showed a supple filigree and textural lightness, and made the fast pace seem easy. The cadenza chosen was the more demanding ossia, and indeed it is more musically satisfying, allowing the inner voices and harmonies to emerge clearly. and slowly and gradually he advanced the swelling tensions, and the appearance of the famous theme was announced with impeccable virtuosity. In the Intermezzo, one was struck by beautiful playing again on the solo oboe, the idea of which was picked up by the strings, with its tired, sadly reflective theme expanded through the whole orchestra, then picked up again by Matsuev. He is not a flamboyant or overly demonstrative artist, more a solidly secure giant of an artist dedicated to bringing out the notes with clarity and beauty, always true to the composer’s writing. He now set the change of tempo, and with the whole orchestra, the finale began, opening with dazzling playing, and thunderous keyboard technique, Matsuev made it all look so easy, and with a sensitive accompaniment by the orchestra, and fabulous oboes, the build in tempo to the final culmination, which must be incredibly punishing for the soloist, but so breath-taking to watch and listen to! The finale of this last concerto in this mini-Rachmaninov festival was met by a roar of applause, and many were standing in ovation. Again – as is a custom here – more than a dozen young ladies presented the conductor and soloist with huge bunches of flowers and kisses. In all, this was festive event for all present marking this noteworthy Rachmaninov anniversary for the dedicated Moscow public.